Twice in the past week, first responders have been called to the company's Ronler Acres campus. Emergency crews were called to Intel's Ronler Acres campus twice in the past week, after more than a dozen people reportedly suffered breathing problems at the manufacturing site. 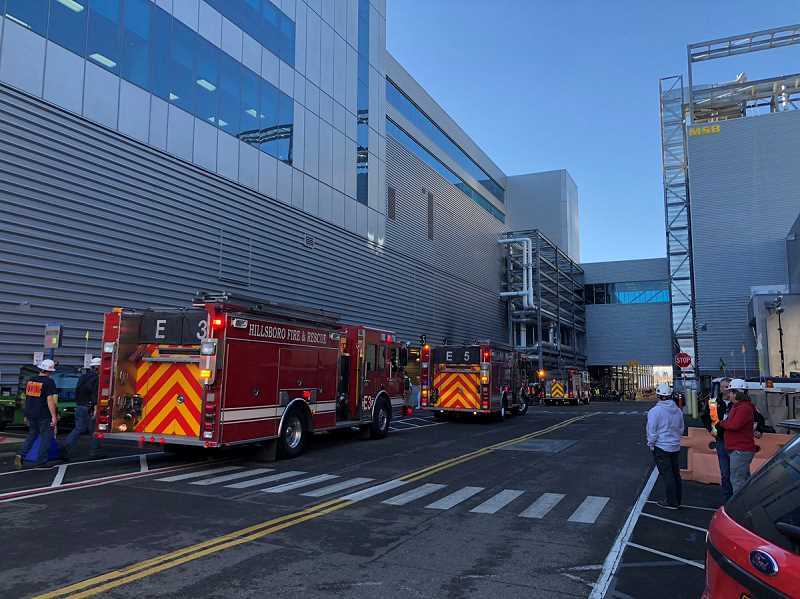 On Monday, Dec. 3, Hillsboro firefighters and other first responders were called to the massive microprocessor manufacturing facility, 2501 N.E. Century Blvd., amid reports of a possible "toxic exposure." The building was evacuated and fire investigators are on scene, according to Hillsboro Fire Department. According to Hillsboro Fire Department spokesman Nathan Leek, 22 patients were treated on Monday after they began experiencing an "irritation of their respiratory system." Six of those patients were sent to local hospitals via ambulance for additional treatment. Leek said it did not appear that that any harmful chemicals had been released. "At this point, we're still unsure (of what caused it) and are still investigating," Leek said. Thursday's incident occurred in the same building firefighters investigated on Thursday, Leek said. "That whole area has been under increased air monitoring in the past few days," Leek said. "(Intel's air quality) is always monitored, but they're increased it since last week. We haven't found any indication of a chemical release at all." In total, Leek said, five fire engines and five ambulances were called to the facility on Monday morning, as well as the county's regional Hazmat unit, run through Tualatin Valley Fire & Rescue. It was the second time this week that crews have responded to reports of toxic exposure. On Thursday, Nov. 29, 15 Intel employees were taken to local hospitals after reporting similar issues. According to the Hillsboro Fire Department, 11 employees at Ronler Acres began to experience minor breathing difficulty. They were transported to area hospitals. Four more employees were taken to hospitals later that day. No information has been released, yet, as to what may have caused either of the incidents. But Hillsboro firefighters later stated that "no hazardous materials" had been released. The Hillsboro Fire Department and Intel are investigating the two incidents. Intel has launched an internal investigation, according to the Hillsboro Fire Department. Leek said Intel's on-staff nurses will continue to monitor the situation. "It wouldn't surprise me if they have a few stragglers coming in who don't feel well," Leek said.